The Department of Neurosurgery values the voice of our patients and their families. 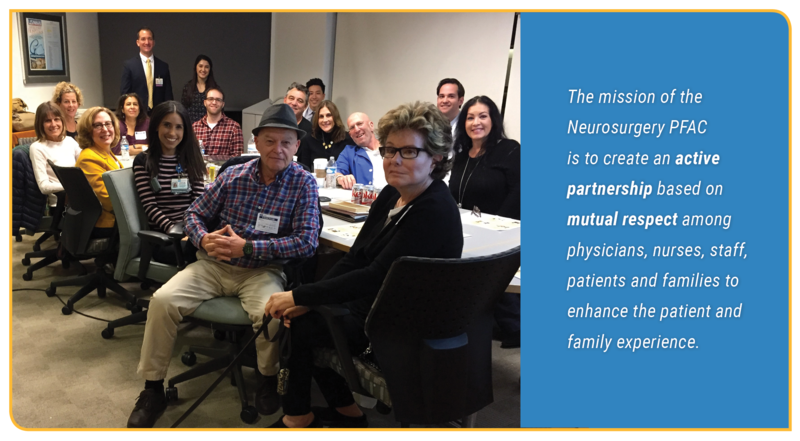 The Neurosurgery Patient and Family Advisory Council (NPFAC) was launched in 2012. It is one of the first PFACs formed within UCLA Health. The council was formed in order to facilitate collaboration between the Neurosurgery physicians, staff, patients and families. The group consists of a number of former patients and family members (spouses and parents) treated for a variety of conditions as well as members of the Department of Neurosurgery. If you have any questions about our program, please contact Diana Babayan at dbabayan@mednet.ucla.edu.